TUSCALOOSA, Ala. – No. 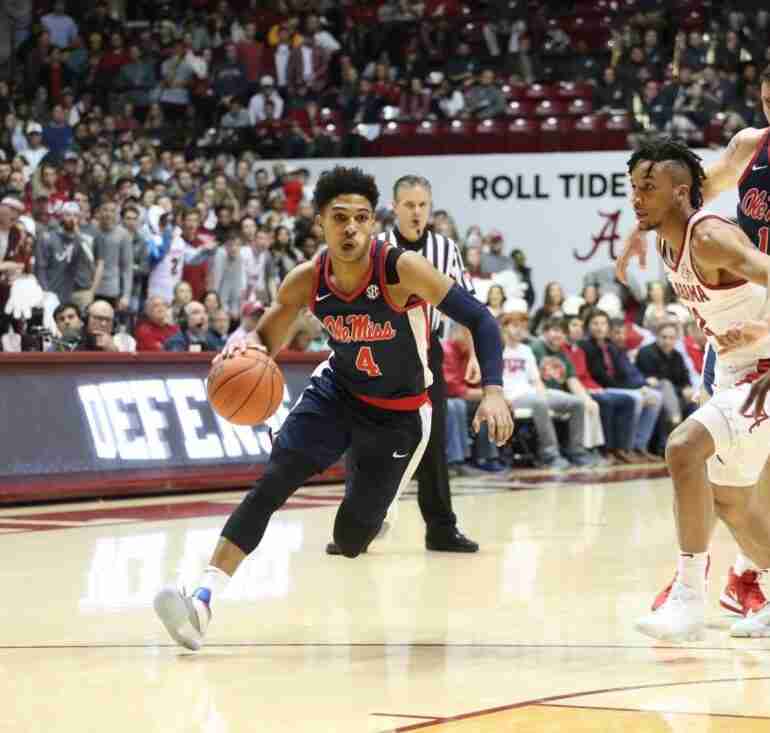 20 Ole Miss (14-4, 4-2 SEC travelled to a hostile Coleman Coliseum and dropped a Tuesday evening contest to the Alabama Crimson Tide, 74-53, the first conference road loss for the Rebels. Ole Miss came out on the wrong side of a lopsided rebounding battle, 44 to 32. This was caused not only by the athleticism of the Tide’s big men, but by the Rebs’ post play underneath the basket. Alabama (12-6, 3-3 SEC) also dominated Ole Miss in the paint, outscoring the Rebels 34-16 on points scored in the paint. A solid Alabama crowd witnessed what was one of the poorest offensive outputs of the season for Ole Miss. The Rebels’ total of 53 points counts as the lowest scoring performance of the season for head coach Kermit Davis’ team. Only one player for Ole Miss scored in double digits on the evening—Terence Davis notched 10. Unfortunately, with nearly 15 minutes remaining in the contest, T.D. picked up his fifth foul of the evening, knocking him out of the remainder of the game. Turnovers also hurt the Rebels as they gave up 23 points off of 16 total turnovers while also committing 20 fouls on the evening. Louis Rodriguez, Zach Naylor, and Brian Halums got some late minutes for Ole Miss. Breein Tyree finished with 9 points, while Bruce Stevens and Rodriguez each added 7 for the Rebels. Blake Hinson and Halums notched 5 apiece. Alabama’s Petty led all scorers with 15 points. With 10 points in 19 minutes, Terence Davis (1,296) passed Marshall Henderson (1,293) and Stefan Moody (1,294) to jump to 19th on the Ole Miss all-time scoring list; Davis fouled out with 16:04 left in the game. Junior college transfer Brian Halums made his SEC debut, scoring five points in a career-high 11 minutes. Ole Miss will return home this coming weekend to the Pavilion to host Iowa State in the Big 12-SEC Challenge. This offers a huge bounce-back opportunity for the Rebels. The game tips off at 11 a.m. (CT) and will be televised on ESPN.